With the client credentials grant type, an app sends its own credentials (the Client ID and Client Secret) to an endpoint on Apigee Edge that is set up to generate an access token. If the credentials are valid, Edge returns an access token to the client app. This topic offers a general description of the OAuth 2.0 client credentials grant type and discusses how to implement this flow on Apigee Edge. Most typically, this grant type is used when the app is also the resource owner. For example, an app may need to access a backend cloud-based storage service to store and retrieve data that it uses to perform its work, rather than data specifically owned by the end user. This grant type flow occurs strictly between a client app and the authorization server. An end user does not participate in this grant type flow. Roles specify the "actors" that participate in the OAuth flow. Let's do a quick overview of the client credentials roles to help illustrate where Apigee Edge fits in. For a complete discussion of OAuth 2.0 roles, see the IETF OAuth 2.0 specification. Client App -- The app that needs access to the user's protected resources. Typically, with this flow, the app runs on server rather than locally on the user's laptop or device. Apigee Edge -- In this flow, Apigee Edge is the OAuth authorization server. Its role is to generate access tokens, validate access tokens, and pass authorized requests for protected resources on to the resource server. Resource Server -- The backend service that stores the protected data that the client app needs permission to access. If you are protecting API proxies hosted on Apigee Edge, then Apigee Edge is also the resource server. You can find a complete, working sample implementation of the client credentials grant type on GitHub. See Additional resources below for links to more examples. 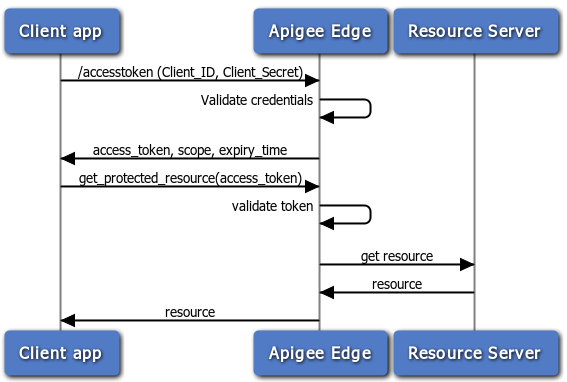 The following flow diagram illustrates the client credentials flow with Apigee Edge serving as the authorization server. In general, Edge is also the resource server in this flow -- that is, API proxies are the protected resources. Here is a summary of the steps required to implement the client credentials code grant type where Apigee Edge serves as the authorization server. Remember, with this flow, the client app simply presents its client ID and client secret, and if they are valid, Apigee Edge returns an access token. To receive an access token, the client POSTs an API call to Edge with the values for client ID and client secret obtained from a registered developer app. In addition, the parameter grant_type=client_credentials must be passed as a query parameter. (However, you can configure the OAuthV2 policy to accept this parameter in the request header or body -- see OAuthV2 policy for details). result = aBase64EncodeFunction(ns4fQc14Zg4hKFCNaSzArVuwszX95X:ZIjFyTsNgQNyxI) // Note the colon separating the two values. Note that the API call is sent to the /accesstoken endpoint. This endpoint has a policy attached to it that validates the app's credentials. That is, the policy compares the submitted keys with the ones that Apigee Edge created when the app was registered. If you'd like to learn more about OAuth endpoints on Edge, see Configuring OAuth endpoints and policies. If the credentials are okay, Edge returns an access token to the client. If not, an error is returned. Now, with a valid access token, the client can make calls to the protected API. In this scenario, requests are made to Apigee Edge (the proxy), and Edge is responsible for validating the access token before passing the API call along to the target resource server. For an example, see Calling the protected API below. As the authorization server, Edge processes requests for access tokens. As the API developer, you need to create a proxy with a custom flow to handle token requests and add and configure an OAuthV2 policy. This section explains how to configure that endpoint. The easiest way to show how the API proxy flow is configured is to show the XML flow definition. Here's an example API proxy flow designed to process an access token request. For example, when a request comes in and the path suffix matches /accesstoken, the GetAccessToken policy is triggered. See Configuring OAuth endpoints and policies for a quick overview of the steps needed to create a custom flow like this. You need to attach a policy to the endpoint, as follows. See Configuring OAuth endpoints and policies for a quick overview of the steps needed to add an OAuthV2 policy to a proxy endpoint. This policy is attached to the /accesstoken path. It uses the OAuthV2 policy with the GenerateAccessToken operation specified. To protect your API with OAuth 2.0 security, you need to add an OAuthV2 policy with the VerifyAccessToken operation. This policy checks that incoming requests have a valid access token. If the token is valid, Edge processes the request. If it is not valid, Edge returns an error. For the basic steps, see Verifying access tokens. Apigee offers online training for API developers, including a course on API security, which includes OAuth. OAuthV2 policy -- Has lots of examples showing how to make requests to the authorization server and how to configure the OAuthV2 policy.